Esperanzah is a versatile singer: she could sing jazz, house, rock with no problem. Numaads mix jazz, soul a bit of hip hop and lounge music creating a good mixture which is well arranged thanks to a great balance of different elements. Vinyl samples, rhodes keyboards, fat bass guitar, few electronic sounds and syncopated drums are there waiting for Esperanzah's voice for giving them the vital breath. Sinuous, deep and passionate, she will convince the audience in no time and if you want to check a nice experimental version of the main track, check the Robot Koch version as he made a sort of experimental ambient two step version of it. Given away for free with the next issue of Sound Projector magazine and with every purchase you do directly from the label, SOUND ON PROBATION 2010 is the first label compilation that gathers tracks from the past and future releases. The ten tracks of the CD cover every Laurent Perrier's musical project so, basically, this compilation is also a good way to getting to know his multi faceted musical world. You'll find Zonk't with its electronic experimentations, the dub metal guitarism of Cape Fear, the minimal experimental variations of what he does under his own name (here there's also a track from the forthcoming collaboration with Laurent Pernice), the dub ambient jazzy tunes of Heal and the crackling sounds with the add of sub/low frequencies of Pylone (here with a track born from a collaboration with Kinetix). We pass from minimal experimental sounds to rhythm based tracks in no time and we could appreciate in full the Sound On Probation catalog. First appeared on a release in 1995 on the "Elektrauma 2" compilation, 9 Elma fifteen years after present their debut album COEUR LIQUIDE. 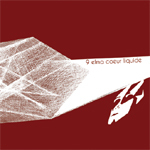 Composed by Grazia Dell'Oglio and Stephane Tremel (sound designers), with the "machines" control of Laurent Le Fers (boss of the M-Tronic label) plus the live help of Cecile Fayolie, who is in charge of the live arts, COEUR LIQUIDE is a multi faceted album which contains elements of techno, industrial and a bit of retro electro (check the final part of "The call of Elara"). "Uranium 238" is the perfect track to check first because gathers them all: it starts with a robotic voice, electronic industrial beats and a techno acid pulsating bass line just to follow with a male/female duet followed by an electro techno beating tune. Analog drums and electronic beats continue to lead the track while synth arpeggios come and go. The following "Square dance" is an upbeat instrumental tune that has acid techno, ambient and industrial elements. The style changes again with "Sphere" thanks to distant electronic percussive noises which function as a background to a melancholic piano/synth pad melody. Sidereal atmospheres, techno/electro and industrial percussive sounds make of this album a release you shall not miss. The album is also enriched by four good mixes performed by Lyynk ("View from the sky" is the track they chose and they made it turn into a dark Middle Eastern slow industrial e.b.m. tune), Displacer ("Shaman" is the song they picked up and now it sounds like cinematic breakbeat tune), Architect ("Square dance" has been turned into a slow industrial two step tune) and Millimetric (now "Uranium" sounds like retro techno tune). Formed by a team of mysterious producers that live in the Berlin area, the Rhythm Monks will release a 12" titled PRIMAL BEAT, on July the 21th. It contains three versions of the main track which into its video edit version is based on a rhythm popular in the Siguiri, Kankan and Kouroussa regions in Africa which is used during disputes among the men of the villages. This preamble is to make people understand that the team wants to link their music to the tribal origin of music where rhythm was playing a basic part of life. The original tune has an involving rhythm, a simple bass line and fresh vocals thanks to their guest, Barbara Panther. The whole result is a nice dance electro pop summer song with tribal approach. The other two tracks are remixes by Timo Maas (he did a great techno electro tune with driving rhythms and saturated sounds) and Mutant Clan (their version of the song show their ability to make techno psychedelic sessions, as it seems kinda mixed during a live performance). In my opinion this single is a summer release that is kinda hiding what is next, because judging by the video posted on the Rhythm Monks website their are capable of much more. They have an innovative show make of screen projections and interactive midi music/images system. As remported on their website: "All-shaped drums with electronic pads, a robot built by robocross.de as well as unique projection techniques are part of the extraordinary show".